Formerly Samudra Weight Loss the new name Success Weight Loss reflects the amazing success this local weight loss business has been experiencing. Kristin Bjarnason, owner and a registered nurse for over 30 years says our history of nearly 6 years in the community is built on our client’s enthusiastic referrals as well as many of our referrals coming from the medical community. The key ingredient is the exceptional and personalized, supportive coaching that ensures clients meet their weight-loss goals and not sacrifice muscle. An impressive 16,000 lost pounds and counting the weight loss approach offers a medically researched and designed program that employs Ideal Protein a high quality protein with blended carbohydrates and fat ration. Kristin is proud that she and her team of certified coaches have helped so many people lose so much weight, and the nurse in her equally values the decreased blood pressure and blood sugar levels that come with that weight loss. In fact, that was what drew her to the program in the first place. Coupled with weight loss coaching Kristin has a passion for teaching Mindfulness Meditation and Yoga and brings elements of these modalities to her coaching with staff and clients. 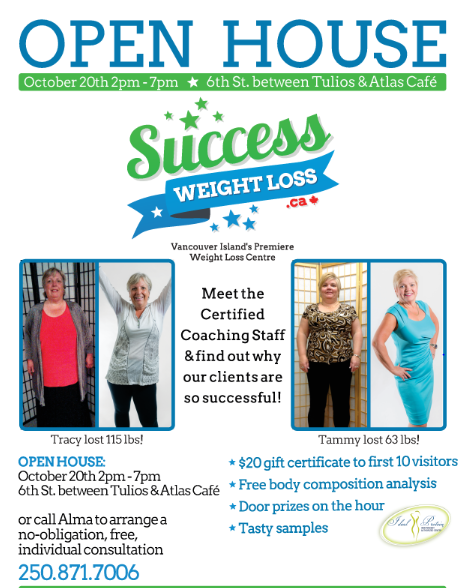 The staff at Success Weight Loss are looking forward to serving the communities of the Comox Valley and Oceanside for years to come and helping our residents be the best they can be with state of the art weight loss education.